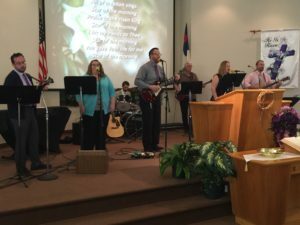 We are so thankful for our Praise Band and the tremendous contribution these individuals bring to our worship services on the second and third Sundays each month! They use their talents to lift our eyes and hearts heavenward! We provide children’s Sunday School classes from 2 years old through Senior High. We use curriculum from Regular Baptist Press, which is known for its Biblical integrity and doctrinal soundness. Sunday School and Adult Bible studies begin each Sunday morning at 9:30 am. Throughout the year we typically offer men’s and women’s electives, along with traditional classes that focus on Bible exposition, theology, and other topics related to Christian living. On the first Wednesday night of each month, we gather together at 7:00 pm as a church family to engage in earnest, corporate prayer. In addition to praising God for His grace and many blessings, we talk to Him and present the various spiritual and physical concerns related to our church, nation, and world. This prayer gathering features prayer as a large, assembled group— then we break-up into smaller groups and pray through our weekly prayer sheet which includes the praises and requests of our church family and friends. Each week prior to the pastor’s message, children are dismissed for Children’s Church (Ages 4-6). Kids enjoy an age-appropriate lesson of their own while Dad and Mom enjoy the message in the main service. The Christian Character Club program is designed to develop Christian character in the lives of children from preschool-6th grade. Every week, clubbers learn what it means to practice obedience, honesty, and humility! Clubbers learn these traits through Scripture memory, songs, games, and crafts. This program will help teach your children Biblical values that will serve them for a lifetime. This teen ministry for Jr. and Sr. Highers (7-12th grade) meets every Sunday evening for games, refreshments, relevant Bible study, music, and prayer. This ministry runs year-round and provides many opportunities for spiritual growth and times for fellowship. Our youth leaders— Will and Maria Stanley— love teens from the heart and impact them in a positive way for Christ! ‘Band of Brothers’ is the name of our men’s ministry that meets at various times throughout the year for food, friendship, and encouragement in the things of Christ. Most of the events are held outdoors, but in some cases it might be coffee and a movie. Each June our men take a 2-day overnight trip for camping and fishing in the Pocono Mountains. While the food is always delicious and the fresh air enjoyable— the prayer times and the devotionals shared by the brothers are even more encouraging to the soul. Big Things Happen In Small Groups! Have you ever wished someone would really care about you as a person? Are you longing to grow closer to God through a community of believers? If so, then Small Groups are for you! Small groups help us accomplish many of the “one-anothers” of Scripture. Meeting in host homes throughout the Hazleton area, our small groups are Bible-study, fellowship, discipleship, prayer, and friendship all rolled into one. We have a small group just for you! Where and when do Small Groups meet? Answer: Small Groups meet twice-a-month in host-homes throughout Greater Hazleton. There is a group meeting near you. Answer: Mark ‘Small Groups’ on the back of your communication card this Sunday. A group leader near you will be in touch with you about joining their group. Do I have to pray in front of people? Answer: No, but if you have a prayer request or some special need, you’ll want to share it so others can pray for you. Answer: Small Groups generally begin in late September and run through the end of May. There is room for growth in every group so it’s never too late to join.